MXB Coarse Powder Mill is a kind of new high-tech milling machine to meet the requirements of coarse powder processing customers. Based on our experts' many years research experience in the milling industry and considering recommendations and requirements of domestic and foreign clients, it is the ideal equipment to replace Raymond Mill, Ball Mill and other traditional grinding mills which only process fine powder materials. MXB Coarse Powder Mill is used for pre-processing of various crushable non-flammable and non-explosive brittle materials with Mohs under 9. It is widely applied in quartz sand, silica sand, foundry sand, fine sand and other sand abrasive industry. It is also applied in industries of mining , construction , metallurgic, road building and water conversancy etc. 1. High efficiency of spare parts. As materials fall from top to bottom, roller and ring are equally worn. Thus the life span could be 3 times higher than that of Raymond Mill. 2. High efficiency of processing fine sand. 80% of the finished sand could be finer than 1-2mm. 3. 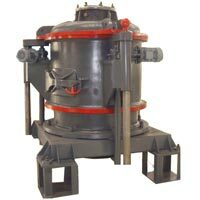 This machine could be used as the pre-grinding equipment before ball mill so as to increase Ball Mill efficiency by 50%. 5. Mainly used for pre-processing of various crushable non-inflammable and non-explosive brittle material with Mohs Hardness less than nine. MXB Coarse Powder Mill is a kind of new high-tech milling machine to meet the requirements of coarse powder processing customers. Based on our experts years research experience in the milling industry and considering recommendations and requirements of domestic and foreign clients, it is the ideal equipment to replace Raymond Mill, Ball Mill and other traditional mills which only process fine powder materials. MXB Coarse Powder Mill from the professional manufacturer of grinding mill ZENITH is a high-efficiency equipment used for pre-processing of various crushable non-flammable and non-explosive brittle materials with Mohs under 9. It is widely applied in quartz sand��silica sand��foundry sand��fine sand and other sand abrasive industry. It is also applied in industries of mining��construction��metallurgic��road building and water conversancy etc.